Identify key policies, programs and financing sources and assist with designing policies and implementation plans that will promote climate-resilient economies and lead to lower-emission futures in key sectors and areas of the economy. 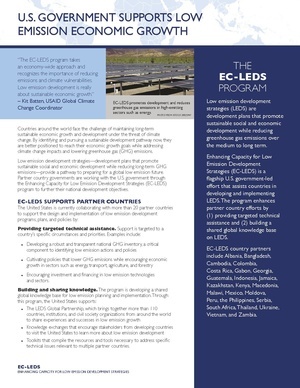 The EC-LEDS program supports and enhances country development programs, plans, and policies and complements efforts of other international donors. Partner countries repeatedly request and require assistance on GHG inventory and the creation of a sustainable framework for updating GHG data. Additionally, many countries have requested staff support in the non-environmental ministries to ensure that the LEDS is cross-cutting and economy-wide. As of November 2012, the U.S is working with more than 20 countries as part of the EC-LEDS program. The U.S. has established joint EC-LEDS work programs with 13 countries, including Albania, Bangladesh, Colombia, Costa Rica, Gabon, Indonesia, Kenya, Macedonia, Mexico, Moldova, the Philippines, Serbia, and Vietnam. This page was last modified on 19 December 2013, at 15:22.